Kra is a Japanese visual kei band with a mix of pop, rock, and jazz sounds. Debuting in 2001, Kra soon signed on with the popular label PS Company. Kra made their major artist debut with their third single "Heart Balance" on September 21, 2006. They are credited with the first opening theme song for Yu-Gi-Oh! 5D's, "BONDS -kizuna-". 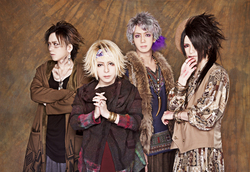 The band members are: Keiyuu on vocals, piano, and guitar, Taizo on guitar, Yuhra on bass, and Yasuno on drums. Kra's newest EPs, Uchuu Traveller CORE and Uchuu Traveller CELL were released in September of 2016. 2016 also marked Kra's 15th anniversary. They released a new album in January 2017, Kra no Susume, featuring new recordings of some of their classic songs.